I was describing the old A-1D "Spad" and wondering if the Air Force Farce (certainly an appropriate tag when discussing close air support of ground troops by the mainstream AF) would transfer some A-10s to the Marines. Today, 100 percent of United States Air Force (USAF) and United States Navy (USN) student pilots train in a Hawker Beechcraft aircraft. Also, Hawker Beechcraft has been meeting the needs of over 50 foreign military nations around the world with trainer, weaponized trainer and special mission aircraft. The Beechcraft AT 6 incorporates the very best of proven training methods and close air support capability to meet light attack and armed reconnaissance requirements. AT-6 capabilities cover a wide-mission spectrum that includes training, manned Intelligence Surveillance and Reconnaissance (ISR) and light precision attack, while at the same time offering non-traditional capabilities for homeland defense and civil support missions. Embraer spared no effort in providing the Super Tucano with an Armament System that incorporates state-of-the-art technology. The Super Tucano is designed to carry a fighter's typical array of weapons - either smart or conventional. Its armament line-up is fully integrated with its avionics system and may be fitted with most advanced ordnance and sensors. The aircraft features two .50" machine guns (200 rounds each) in the wings. Five hard points under the wing and fuselage allow up to 1,500 kg of weapons for most configurations. The aircraft's inboard stations, as well as its ventral one, are "wet" for underwing fuel tanks. In addition to its two internal machine guns, the Super Tucano can be configured with additional underwing armament stations, such as two 20mm gun pods or .50" machine guns, thereby significantly increasing its firepower for missions requiring air-ground saturation. Outboard stations allow the loading and firing of short-range air-air missiles of the AIM-9X class. All stations can be loaded with the Mk 81 or Mk 82 (conventional or smart) bombs, SBAT-70/19, LAU-68 A/G Missile Launchers or MLB Bombs. They both look good. I wonder if they can land on an amphib? Well, there you go, ruining my little joke with something like facts. By the way, my dad was an Air Force officer, with whom I had many interesting discussions about such things. He had some experience in CAS. Interesting to see how this shakes out, don't see the AF giving up the A-10s to the Marines, though, even though my understanding is that they didn't want them in the first place. I imagine they would fear this as an opening for the Army to want to scrap Key West and develop their own CAS capability beyond rotary wing. 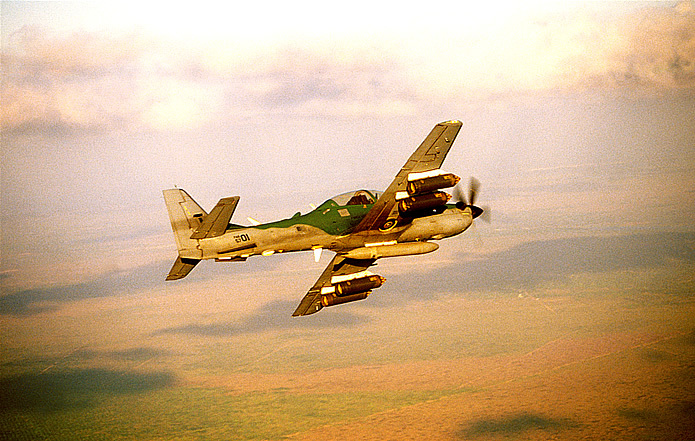 I've seen OV-10s operate from amphibs quite a few times, both launch and recovery, when the USMC still maintained them. The Beech could probably do as well, though they might need to augment it's slow flight capability to make the approach speed slower for non-arrested landings on amphibious ships. One of those many holes in our capabilities that have developed over the years that need to get plugged. Why would the Marines want A-10s? A-10s can't operate from carriers or amphibs. They're tied to land bases. The Marines can already fly Harriers, F-18s and (some day) F-35s from those same bases. Adding A-10s would just strain the Marine aviation budget with an aging airframe with duplicative capabilities. There's this persistent myth that the A-10 is somehow the only aircraft that can "legitimately" perform CAS. This is simply not the case. It just has different characteristics from other USAF/USN/USMC aircraft. Some better, some worse. E1 several thoughts on this: First the AF types who fly smaller a/c are certainly true warriors who help the troops. Unfortunately their leaders are far more interested in big buck zooming planes - IHMO. Facts: this project was originally started to give AF a plane for FMS to smaller air forces. Something the Congress might chop? Then some realists saw it value for our own missions. Bell ring! While the birds are low end, they would give USAF another asset to perfrom CAS for other services (not something all of AF is known for). Take a look at that multi-part post on SMSgt Mac's Elements of Power blog I posted earlier. IMHO, he eloquently sums up (and tears down) the myths surrounding USAF CAS. That being said, IMHO, there is a place for the LAARA program as a training asset. B.Smitty - I see the need is for ship-based slow, long-linger CAS. Takes a good deal of the logistics issues out of the picture. I can see value in a ship-based, long-loiter, multi-mission aircraft that could perform CAS in addition to ISR, maritime patrol, ASW and ASuW missions. It could be manned or unmanned. A General Atomics Avenger could do some of this, assuming it can be made carrier-compatible. J-UCAS could as well. 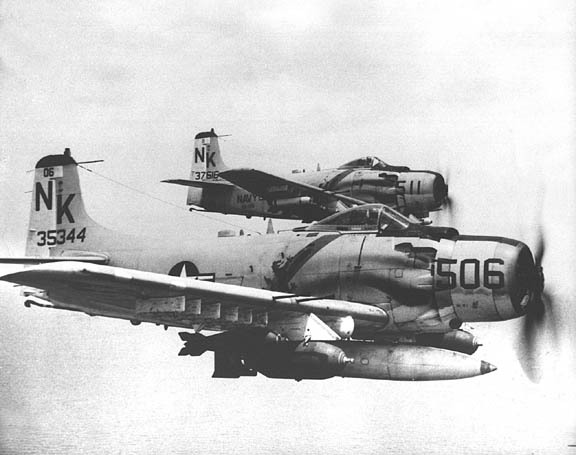 Long-loiter, manned aircraft are aircrew-limited to 7-10 hour sorties (assuming a fighter-sized cockpit). And if they are slow, you have to disperse them to many small airfields (floating or not) near the area of operations, to ensure timely CAS coverage. Carrier-based, slow CAS could therefore only provide long-loiter coverage fairly close to the carrier due to transit time to and from the CAS orbit. Plus, we only have a limited number of carriers, even throwing in the LHA/Ds. I am with Chuck Hill about this bird. It would be nice for inner circle air defense around DC. Currently USCG Dolphins are used for that mission, and they can be out flown by many civilian aircraft. Smitty, I don't agree, CAS must be close and quick to get where one needs them. Ship-borne CAS are more for backup. MY definition of CAS is when I heard the empty brass from Seawolves overhead bounce off my PBR's canopy, 5 minutes after I yelled help!. Even the Black Ponies came later with heavier ordnance. I think we agree that the key components of good CAS are timeliness and appropriate effects. Timeliness is a function of either being overhead already, or having enough speed to get there quickly. An aircraft with a cruising speed of 270kt can only cover a quarter of the area that a 550kt aircraft can with the same response time. And these prop aircraft only bring a fraction of the ordinance of a multi-role fighter. IMHO, the AT-6 is only mediocre for inner circle air defense around DC. Maybe it could catch small, slow props, but it would be left in the dust by any small bizjet. Smitty Timeliness in the case sited was the Seawolf landing pad being about 2 klicks down the river~ Black Ponies were mostely in one place Can Tho which put them 15-20 minutes away unless they were on patrol. In the DC situation, why use a sledge hammer when a ballpeen will work? The leakers that get that close to DC I am told don't need heavy weapons to deter, deflect or take down? From what I,ve read about DC air space the inner circle threats are mostly errant general aviation planes which is exactly what the AT-6 could catch. Bizjets are intercepted by the next layer up AF fighters. The other advantage is AT-6s could be flown out any of the numerous small airfields both govt and private around DC like a Ft Belvior, Ft Detrick, Quantico, and College Park. Thereby giving them the proximity needed and readily available fuel.